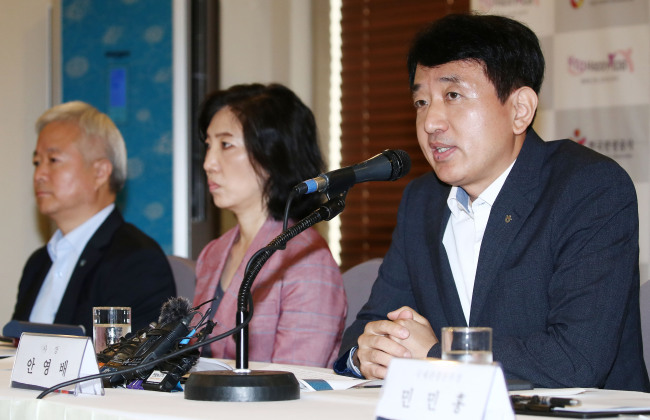 The newly appointed chief of the state-run tourism body presented his vision on its future operation, including expansion of government vacation subsidy programs and inter-Korea border tourism, during a press meeting Monday. Ahn Young-bae, newly appointed president of the Korea Tourism Organization, expressed hopes that the KTO would lead the trend of work-life balance for Koreans. Many Korean workers still have a tendency to postpone or even forfeit their paid vacation days, due to pressure from superiors or peers over work. According to data recently released by the KTO, Korean workers use an average of about 52 percent of their annual leave. It also estimated that having workers use up all of their annual leave would lead to extra spending of 16.8 trillion won ($14.9 billion). This year, the government launched a vacation subsidy program to subsidize workers at small and medium-sized enterprises -- each with 100,000 won from the government and 100,000 from the company -- to go on a domestic trip. A total of 20,000 people will receive the benefit, and 104,512 people from 8,561 companies applied for the program this year. Ahn explained that his goal is to expand the number of beneficiaries to 100,000. He added that this was just a goal of the KTO and the budget details have to be ironed out by the Ministry of strategy and Finance. This will be in parallel to the campaign encouraging workers to freely go on vacation, accompanied by a poster and visual content created by the KTO. Ahn added that he wants to maximize the effect of recent strides in inter-Korean relations by expanding tourism programs at the Demilitarized Zone. He will create a Korean Peninsula Tourism Team (not official name) to come up with a long-term road map for the brand image of DMZ tourism programs, in hopes that the area will become one of the better known tourism sites here.